Photos are courtesy of the author unless otherwise indicated. Figure 1. A root parasite (Krameria lanceolata), right half, invading a grass root (Aristida sp.) left half of image. 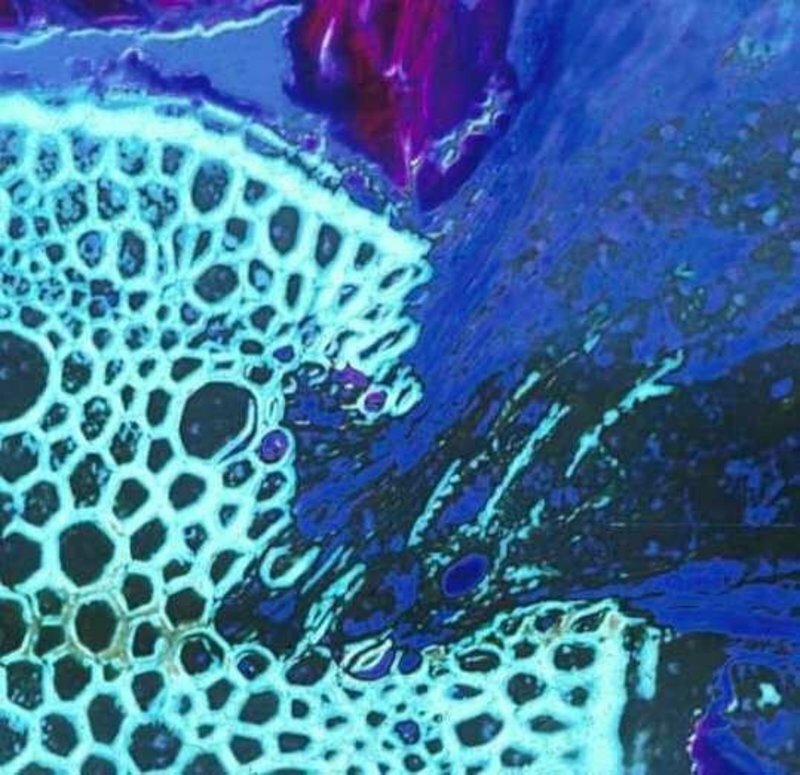 The haustorial tissue is dark blue and the host vascular tissue is light green. Discolored areas in the invaded areas of the host vascular tissue indicate where parasite enzymatic activity has degraded xylem cells. Although parasitic plants are often thought of as weeds, they are part of a guild of highly unique plants. An understanding of their biology is essential for control and management of parasitic plants. 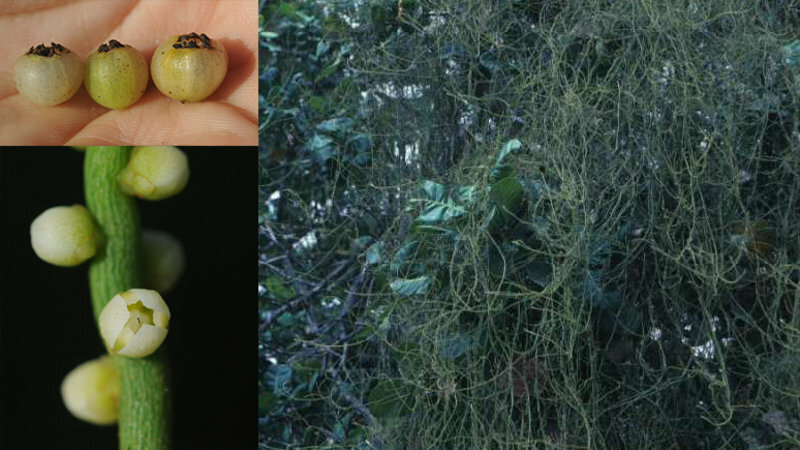 Parasitic plants are amazingly specialized, and have remarkable adaptations. They include herbaceous plants, vines, shrubs, and trees. Some appear innocuous, with no external evidence of their parasitic nature. Others lack leaves and stems, existing only within the bodies of other plants. Parasitic plants’ reproductive strategies also vary widely, from the tiny (1 mm) flowers of some mistletoes to the meter-wide flowers of Rafflesia--the largest flower in the world. However, what all parasitic plants have in common is a haustorium (Figures 1 and 6). The haustorium is the morphological and physiological bridge between host and parasite. It is the conduit for materials that can move from the host into the parasite or from the parasite to the host. Thus, whereas non-parasitic weeds compete with crop plants for water and nutrients in the soil, parasitic weeds obtain these resources directly from host plants. Parasitic weeds can be distinguished by the presence or absence of chlorophyll. Those that produce chlorophyll (and therefore have some photosynthetic activity) are termed hemiparasites (also known as semiparasites). Those that lack chlorophyll (and therefore are not green and totally dependent upon their host for nutrition and water) are termed holoparasites. Another distinction among parasites has to do with how they germinate. Obligate parasites require a host before they can germinate and initiate a haustorium. Facultative parasites, on the other hand, can germinate without a host. Under high fertilizer regimes, some facultative parasites can even mature without a host. Intuitively, it seems like the most serious parasitic weeds would be holoparasites. And indeed, holoparasites in the genus Orobanche are well-known pathogens of a variety of crops. But in Africa, the most serious parasitic weeds are the witchweeds, which are obligate hemiparasites in the genus Striga. Some parasitic plants attack stems, while others are restricted to roots. These are simply referred to respectively as stem parasites and root parasites. Table 1 lists commonly encountered stem and root parasitic plants in Africa. Brief descriptions of important parasitic weeds are explained below. They are mentioned in the same order as they appear in Table 1. Figure 2. Tapinanthus bangwensis parasitizing guava near Abu Naama, Sudan. The globular structure near the center of the photo is where the parasite is attached to the tree. The smaller leaves are those of the parasite. Mistletoes are shrubby, obligate parasites that live in trees and bushes. Africa has a great diversity of mistletoes, with almost 300 species (Polhill and Wiens 2000). A few species are of commercial importance. 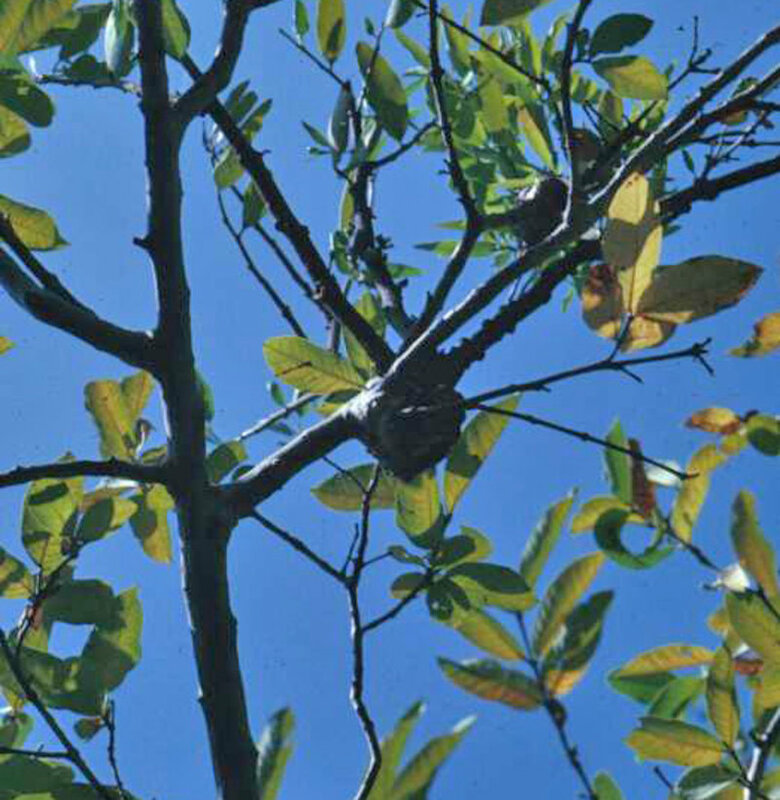 For example, rubber (Hevea brasiliensis) in West Africa is attacked by the mistletoe Phragmanthera capitata. The same mistletoe can infect cola nut (Cola nitida). In Sudan, guava (Psidium guajava) is infected by Tapinanthus bangwensis (Figure 2); heavy infestations can kill the tree. T. bangwensis also attacks citrus trees. Many other mistletoes are pests in Africa, and even previously benign species of mistletoe can potentially attack commercial tree crops. Control of mistletoe is difficult because of the intimate, graft-like connection between host and parasite. Herbicides have offered some success. Manual removal of mistletoe is the most effective, but is expensive in terms of time and labor. Figure 3. Cassytha filiformis on cashew in Guinea Conakry (right). Love vine fruits (upper left) and flowers (lower left). Love vine is an English common name of Cassytha filiformis, a high-climbing herbaceous vine that is widespread in Africa but most common in coastal regions. The plants lack leaves; a love vine plant consists of a stem that bears tiny white flowers and white fruits with a single black seed (Figure 3). Love vine wraps around the host plant and penetrates with peg-like haustoria, often forming large tangled masses. Stems are green and photosynthetic, but the chlorophyll is sometimes masked by orange pigment. Though it can photosynthesize, the plant cannot grow without parasitizing a host. Love vine is regularly mistaken for a species of dodder (Cuscuta sp. ); it can be distinguished from the latter by the presence of short hairs that are evident when the stem is observed with a 10X hand lens. Virtually any woody plant can serve as a host for love vine. Mango (Mangifera indica), a common host in West Africa, appears to be damaged by a combination of smothering, nutrient deprivation, and loss of moisture. Other hosts include cashew (Anacardium occidentale) (Figure 3) and avocado (Persea americana). Control is restricted largely to physical removal of tree branches with attached live vine stems. Prune affected branches as soon as possible to prevent further love vine growth and seed production (Nelson 2008). Burning the trimmings prevents germination of love vine seeds associated with intertwined stems. Figure 4. Cuscuta pedicellata damaging a plot of arugula (Eruca sativa) in Wau, South Sudan (right). Dodders’ flowers and delicate stems are shown on the left. Species of dodder (Cuscuta spp.) are widespread throughout Africa and can cause serious problems in agricultural fields. Dodders are obligate holoparasites (though some species contain traces of chlorophyll). Plants consist only of stems! No leaves or roots are formed. Dodders have no hairs of any kind, which clearly distinguishes them from Cassytha species. Dodder flowers are small and white, and produce a papery capsule with up to four seeds. Under most conditions, the dense tangle of stems dies back after one year. 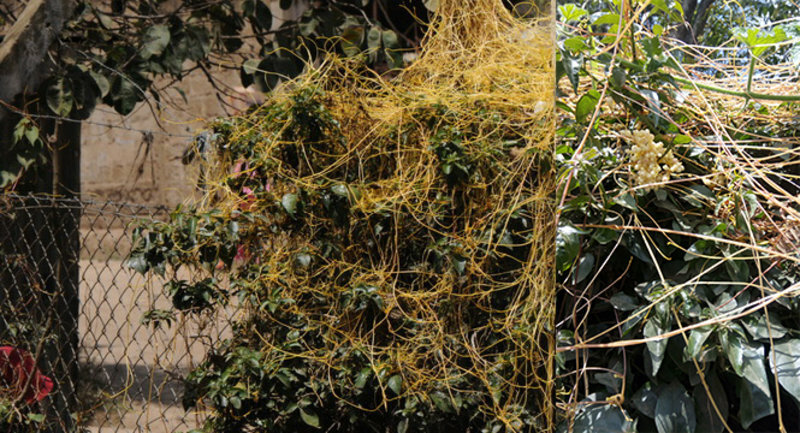 Dodder is hosted by a broad range of plant species, as indicated by the ability of dodder plants to parasitize a diversity of plants at one time. Dodder attacks many field crops, including carrot (Daucus carota), jute mallow (Corchorus olitorius), arugula (Eruca sativa, Figure 4), and tomato (Solanum lycopersicum). Dodder also affects ornamental woody plants such as bougainvillea (Bougainvillea spp., Figure 5). Except for onion (Allium cepa), no documented cases exist of dodder parasitizing monocots; this means that cereal crops such as maize and sorghum are not hosts for dodder. Figure 5. A common sight in parts of East Africa. Cuscuta kilimanjari parasitizing a bougainvillea hedge in Arusha, Tanzania. The photo on the right shows flowers and stems; this photo is by Roger Ronini, used with permission. The best way to reduce dodder’s spread and infestation is through sanitation. Avoid contamination of crop seeds with dodder seeds. Dodder seeds have a rough surface; if crop seeds are passed through felt rollers, the dodder seeds will stick to the felt material and thus be separated from the crop seed. Remove dodder (by hand or using herbicides) when it is found in fields, field borders, and on infested weeds. Herbicide recommendations, other control strategies, and the overall biology of dodders are reviewed by Dawson et al. (1994), Kaiser et al. (2015), and Sarić-Krsmanović and Vrbničanin (2015). Figure 6. Rhamphicarpa fistulosa parasitizing rice near Bouaké, Ivory Coast. Rice suppression is most evident in the center and bottom of the main photo. on the right. Photos on the left show flowers opening at dusk (top) and rice roots with Rhamphicarpa haustoria at arrows (bottom; a millimeter scale is behind the roots). Vampire weed (Rhamphicarpa fistulosa), a facultative hemiparasite, is different from the root parasites described below, which are also in the family Orobanchaceae but which are obligate parasites. 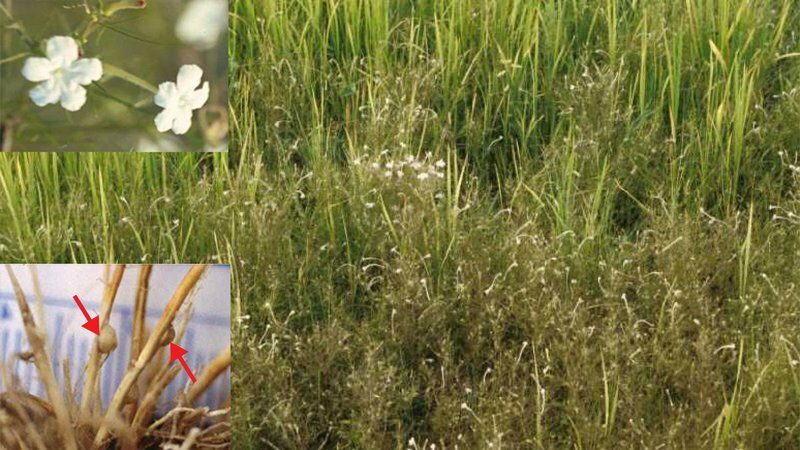 Vampire weed is most notorious for its damage to rice, since it grows in moist areas. It can also attack other members of the grass family. Vampire weed is an annual plant with many branches and divided leaves. Flowers are white and open at night, as is characteristic of flowers pollinated by moths (Figure 6). The fruit forms a beaked capsule containing up to two hundred small seeds. Vampire weed has been known to parasitize grasses for many years, but only recently have its damage and economic impact been realized (Rodenburg et al. 2014). To best prevent infestation, use sanitary measures similar to those discussed for dodder. Management practices, discussed by Rodenburg et al. (2014), include hand weeding, soil amendment with fertilizer or rice husks, and periodic or continuous flooding. “Countries with nascent infestation of Striga only 25 years ago are now showing heavy annual losses of crop yield. 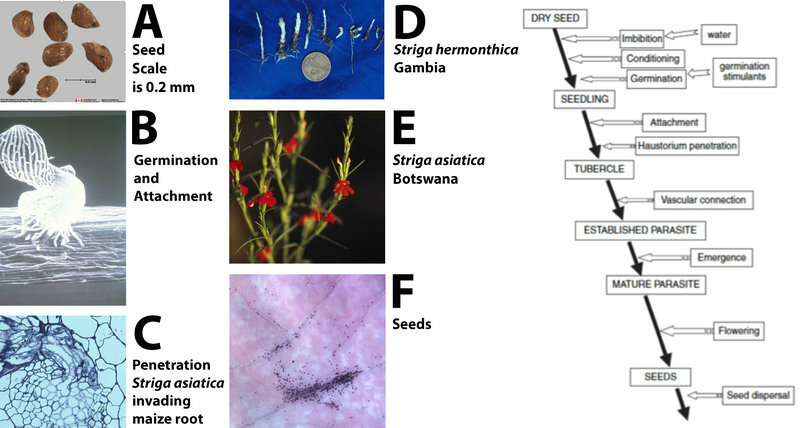 Rough estimates are that nearly 300 million people in sub-Saharan Africa are adversely affected by Striga, and up to 50 million hectares of crop lands in the continent show varying degrees of Striga infestation." From a control standpoint, it is important to emphasize that these are not typical weeds. Crop yield reduction is not due to competition or allelopathy. In fact, with witchweed, damage happens before the parasite is even detected in a field. That is why an understanding of the biology of witchweed is important. Knowing the life cycle helps farmers and practitioners to identify possible points of intervention to control the parasite. Figure 7. The general life cycle of witchweeds. Photo A of seeds by Agriculture Canada seed lab. Diagram (right) adapted from: Joel et al. (2007); Biology and Management of Weedy Root Parasites (used by permission). Witchweeds have a complex life cycle that is well-adapted to the semi-arid tropics (Figure 7). Seeds are tiny (7A, 7F) and highly specialized. They will not germinate unless conditioned through exposure to moisture at a required temperature that varies among witchweed species. Once seeds have been moisture-conditioned, they can respond to a chemical stimulus from the host that triggers germination (7B). The elegant communication between host and parasite has been the subject of much recent research and has resulted in the discovery of a class of plant hormones called the strigolactones (Matusova et al. 2005). These hormones are released into the soil from the roots of host plants, inducing witchweed seed germination. The newly germinated witchweed seed initiates a haustorium with which it attaches to and penetrates the host (7B, 7C). Once a vascular connection is in place, the seedling develops (7D). A striking difference between the behavior of witchweeds and non-parasitic weeds is that host damage ensues as soon as vascular connection is established. The parasite, being underground and lacking chlorophyll, removes nutrients from the host plant. Movement, however, is in both directions and the parasite produces and transfers compounds that alter the architecture of the host plant. For example, when S. asiatica attacks maize, the maize plant produces more roots, providing additional sites for parasitism. 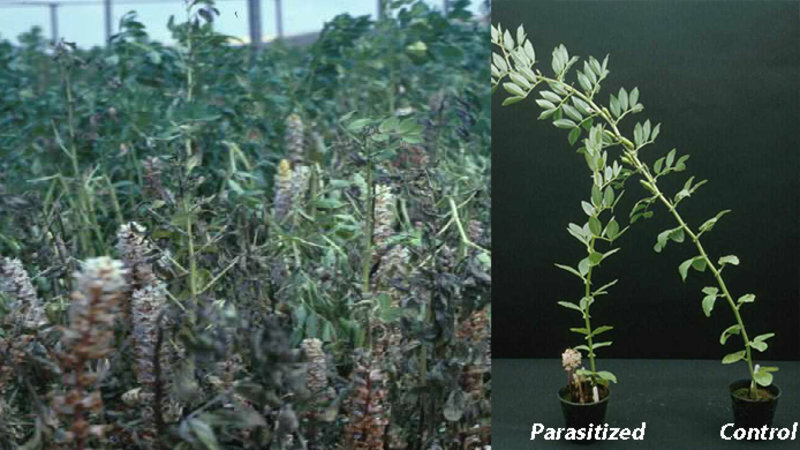 The parasitic plant can also induce the host plant to produce growth inhibitors like farnesol and abscisic acid. While witchweed is still underground, the farmer observes stunted sorghum or other grains, but is often unaware of the presence of the parasitic plant. By the time the witchweed emerges, damage to the host is often irreversible. The parasite will emerge to flower (7E) and to produce seed (7F); while it contains chlorophyll, it does not carry on enough photosynthesis to sustain itself. Witchweed’s ability to produce thousands of seeds makes it extremely challenging to remove from a field. One witchweed plant can produce thousands and thousands of dust-like seeds. These seeds are known to persist in the soil for up to a decade. According to some reports (Parker and Riches, 1993), seeds have survived in the soil for up to twenty years. Weeding does little to hinder host damage but can help reduce seed in the soil seed bank. To be effective, witchweeds have to be pulled as soon as the plants emerge. Early removal of witchweed plants is necessary to prevent seed production. Do not use witchweed for fodder, because the seeds pass through animals without losing viability. Like most weeds, witchweed largely spreads through human activity—especially planting grain contaminated with witchweed seeds. Many different control strategies have been developed. I describe some of them below, following the general outline from a recent and helpful overview by Samejima and Sugimoto (2018). An older paper by Joel et al. (2007) provides a more in-depth review, and contains information on the use of herbicides to control parasitic weeds. Current control measures can be divided into five categories: resistant and tolerant host varieties; cultural practices; microbiological techniques; chemical control; and host-induced gene silencing. Discussion in this document is limited to the first two categories, because they are the most transferable to small-scale farmers with restricted resources. Resistant and tolerant host varieties. It is important to understand the distinction between resistant and tolerant hosts. Resistant varieties of host plants have adaptations that help them to fend off the parasitic plant at some point in the latter’s life cycle. By contrast, tolerant host plant varieties are able to produce an acceptable yield despite a moderate witchweed infestation. About forty years ago, scientists discovered that some varieties of sorghum produced lower levels of germination stimulant than others (Belay, 2018). That research led to extensive breeding programs at ICRISAT (International Crops Research Institute for the Semi-Arid Tropics) and IITA (International Institute of Tropical Agriculture) to exploit those genes. Other varieties provide mechanical and biochemical resistance to parasite invasion and establishment. Availability of sorghum-resistant seed varies between countries; look for releases by ICRISAT and other crop breeding programs in seed supply stores/depots. Smallholder farmers can best address the problem of witchweed by planting resistant and/or tolerant crop varieties, combined with no or low-cost cultural approaches (such as those described below). A farmer would initially need to purchase seed of the resistant or tolerant crop variety, but then could benefit from that purchase for years, assuming that seed of the crop variety can be saved (i.e. is open-pollinated), that it will maintain the resistance or tolerance, and that it is a popular food plant. Cultural practices. Shifting cultivation is a cultural practice that has been used in Sudan and other countries with low populations and available land. The principle is simple: a field is cultivated until the witchweed level severely reduces crop yield, then is abandoned for several years. Many native grasses and some other plants can germinate witchweed without supporting its development. Over a period of several years, the field experiences a kind of sanitation effect, as witchweed seeds germinate and then die. Shifting cultivation may not be an option in highly populated areas with land constraints. The “Push and Pull” method is a recent and promising cultural practice (see, for example, Murage et al. 2015). This technique has been used chiefly with maize, but is now also being used with other grains. Typically, a farmer will intercrop maize with a species of desmodium (Desmodium spp. ), which is a leguminous plant. The desmodium releases a chemical that repels stemborer insect pests, “pushing” the insects away from the maize. Around the maize field, the farmer plants napier grass (Pennisetum purpureum), which attracts stemborers and “pulls” them away from the maize. In addition to repelling stemborers, desmodium also reduces the amount of witchweed in the maize, by stimulating witchweed seeds to germinate but inhibiting Striga haustorium growth (Khan et al. 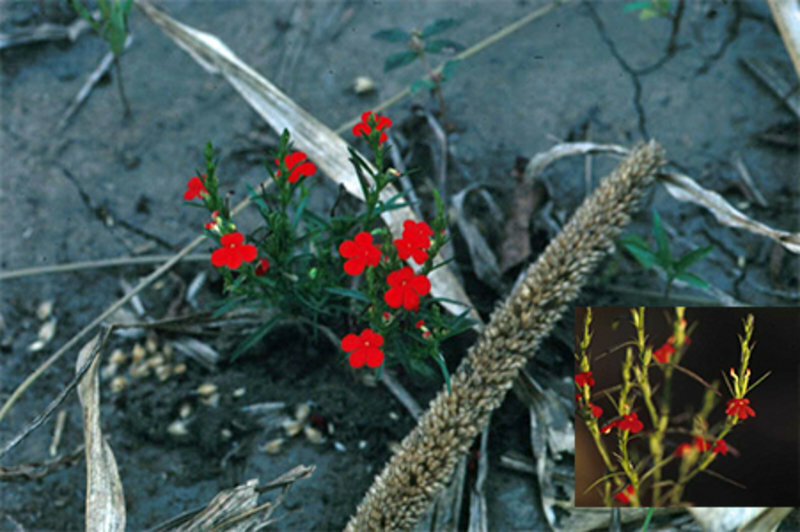 2002); it is an elegant example of a trap crop that germinates Striga but is not parasitized. Grain yields have been found to increase with the use of “push-pull” technology (Murage et al. 2015). Since desmodium is a perennial plant, it provides long-term suppression of witchweed. Other legumes besides desmodium are nonhosts of witchweed, suppressing witchweed in various ways (such as inducing suicidal germination of, and/or smothering the parasitic weeds). Cowpea, crotalaria (Crotalaria ochroleuca), and green gram (Vigna radiata) have been shown to reduce witchweed in Kenya (Khan et al. 2007). The above-mentioned cultural control methods should be implemented in combination with practices that improve soil fertility and organic matter. Rapid release of nitrogen into the soil, either from organic or inorganic sources, has been correlated with reduced witchweed infestation. Ayongwa (2011) suggested microdosing inorganic fertilizer along with inputs of high quality organic matter (i.e. organic matter with a low carbon to nitrogen ratio). Microdosing is the application of small amounts of fertilizer close to each crop plant; this practice greatly reduces the amount of fertilizer needed in comparison to treating an entire field. (Issue 84 of ECHO Development Notes describes microdosing with bottle caps.) Since soil health is important for minimizing witchweed, farmers may benefit from growing susceptible grain crops on a land area small enough to manage well, devoting remaining space to crops that are not hosts for witchweed. 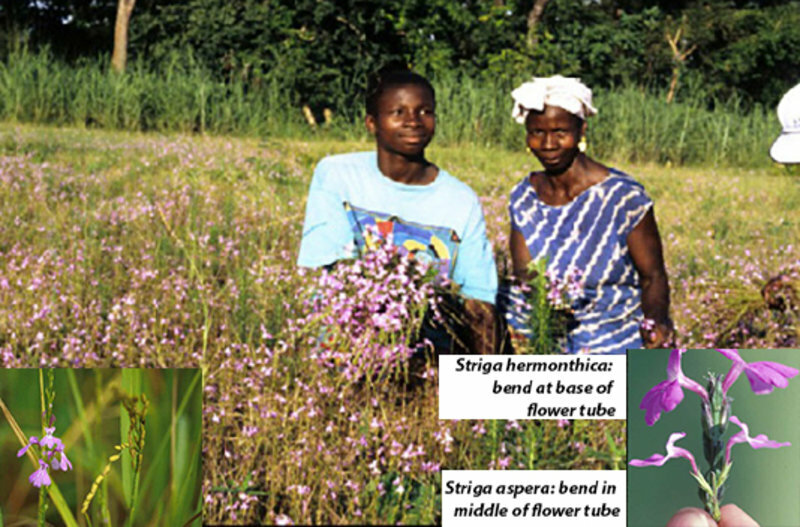 Striga is essentially an African genus, and Africa contains the greatest Striga species diversity. A monograph by Mohamed et al. (2001) forms the basis for the taxonomy and distribution described below. Figure 8. Striga hermonthica in Kadugli, Sudan. The sorghum crop on the left is almost destroyed. Reaching a height of 2 m, S. hermonthica is the largest and arguably the most destructive of the three main witchweeds (S. hermonthica, S. asiatica, and S. gesnerioides). It is found mainly in West Africa and parts of East Africa, but has apparently spread to northern Namibia. S. hermonthica attacks virtually all grain crops, but is reported less often on rice plants. Figure 9. 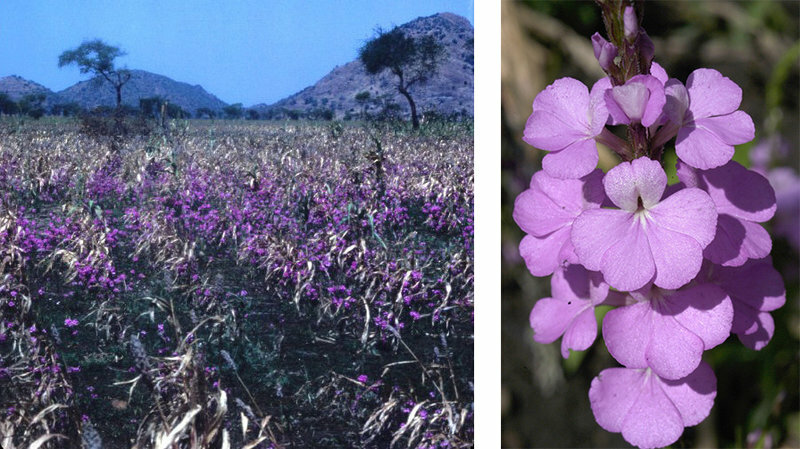 Striga aspera on fonio (large photo) and on rice (left inset photo) in Guinea (Conakry). The inset photo on the bottom right shows the difference in flower structure between S. hermonthica and S. aspera. S. hermonthica is often confused with S. aspera, which looks similar but is a distinct species (Figure 9). Though less damaging than S. hermonthica, S. aspera still causes extensive crop loss in parts of West Africa, where it can be a serious problem on fonio (Digitaria exilis) and sugarcane. It is also known to attack sorghum and rice. Not much data exists for S. aspera, likely because it is mistaken for S. hermonthica. Figure 10. Striga asiatica on millet. The bright red flowers distinguish this species from other agronomically important witchweeds. S. asiatica is a small plant with many branches and with crimson red (rarely yellow) flowers. The most temperate species of witchweed, it can survive at higher elevations in Africa. S. asiatica was introduced to North and South Carolina (in the United States) in the 1950’s; it caused serious damage to maize, prompting a government response that resulted in pioneering research on the biology of witchweeds. As a result, scientists discovered strigol, a compound now known to be one of the strigolactones. Strigol was derived from the roots of cotton (Gossypium sp. ), which is a nonhost for witchweed, so this discovery led to the search for compounds in other trap crops that would induce germination but not support witchweed. In southern Africa, S. asiatica often seriously constrains the cultivation of maize, millet, rice, and sugarcane. It can be a problem in sorghum in central Africa, and is also present in India and other parts of South Asia. Figure 11. Striga gesnerioides. The two photos on the left show S. gesnerioides flowers on cowpea (bottom) and on a species of Euphorbia (top), illustrating the flower variation between forms parasitizing various hosts. The larger photos show S. gesnerioides on cowpea in Benin (middle photo) and Mali (right photo). Unlike other witchweeds, S. gesnerioides attacks dicots rather than grain crops. It is a major factor in yield reduction of cowpeas (Vigna unguiculata) in West Africa, but also can attack tobacco and other legumes such as bambara groundnut (Vigna subterranea). S. gesnerioides is the most widespread and variable of any African witchweed. It is found from Morocco to Sudan, and from Ethiopia all the way to Namibia and South Africa. On crops, S. gesnerioides plants have many branches that are often tinged with purple. Flowers tend to be small with pale purple or whitish corollas (flower petals). As shown in Figure 11, morphology varies greatly within this species. Figure 12. Striga forbesii on sugarcane in Somalia (left) and on maize in Zimbabwe (bottom right). The upper right photo shows S. forbesii flowers in more detail. The big three (S. hermonthica, S. asiatica, and S. gesnerioides) are the most serious witchweeds. Indeed, they are the most serious factor in crops loss in some regions. But S. forbesii has been a problem on maize in Zimbabwe and remarkably damaging, considering the size of the host, to sugarcane in Somalia. This is a medium sized plant up to 1.5 m tall with distinct pink corollas. Figure 13. 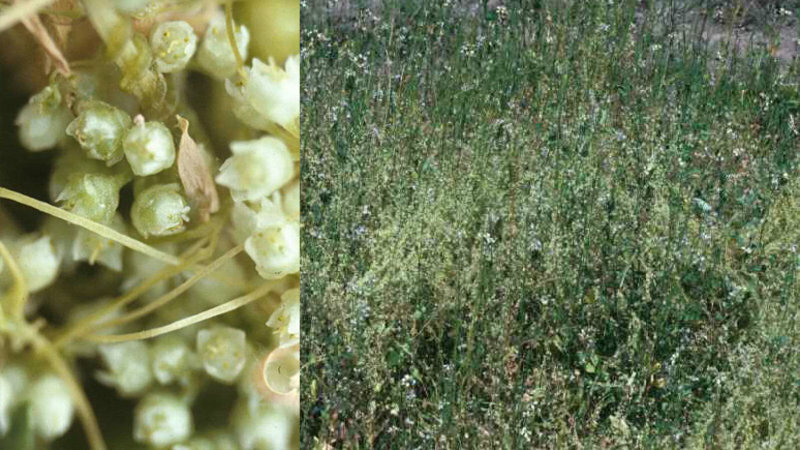 Alectra vogelii on cowpea in Nigeria (right) and Alectra sessiliflora in Namibia (left). Species of the Alectra genus are often referred to as yellow witchweeds; this is an imprecise descriptor because some Striga species have yellow flowers and not all Alectra species have yellow flowers--though Alectra species that are agricultural pests are yellow-flowered. Plants in the Alectra genus are small (up to 0.5 m), usually with many branches and with greatly reduced scale-like leaves. Flowers produce capsules with large numbers of dust-like seeds. Like other witchweeds, species of Alectra are obligate hemi-parasites that require a host stimulant to germinate. They are found throughout tropical Africa, where they parasitize cowpea and peanuts as well as sunflower (Helianthus annuus); unlike most species of Striga, species of Alectra attack diverse families. 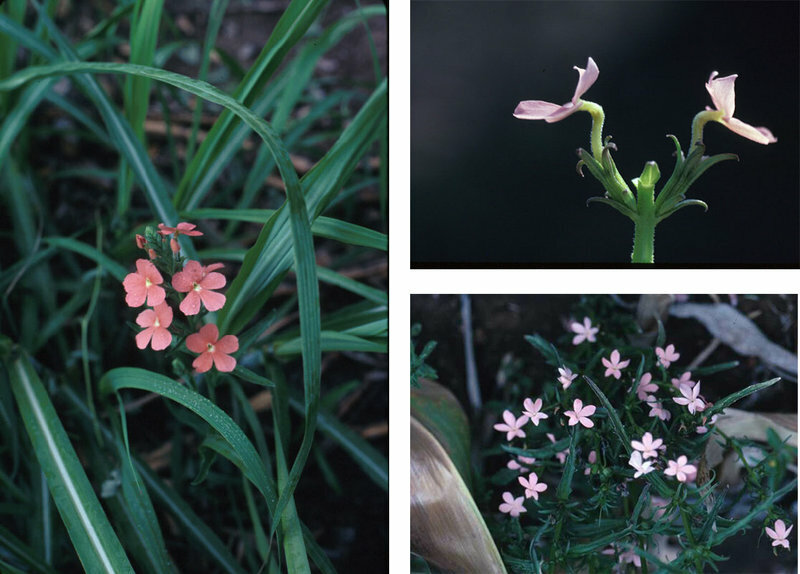 Control methods for Alectra species are basically the same as those for Striga species. Broomrapes comprise two closely related genera, Orobanche and Phelipanche. Unlike the other root parasites we have considered, these plants totally lack chlorophyll. In other aspects of their biology, they are quite similar to the witchweeds (Figure 7), producing very large numbers of seeds that can survive for a decade or more in the soil. This means that many of the control measures used for witchweeds can also be applied to broomrapes. The common name for these plants comes from a species that attacks broom (Cytisus scoparius), a legume native to Europe. Broomrape diversity is centered in the Mediterranean region rather than the tropics. So they are largely temperate in their distribution and can survive colder weather than many other parasitic plants. In Africa, their greatest importance is in the Nile Valley and the Maghreb although they could grow at higher elevations elsewhere. Control methods and details of these fascinating parasites’ biology are found in the compendium edited by Joel et al. (2013). Figure 14. Orobanche crenata on fava bean in Ethiopia. The potted plants show the impact of a single broomrape on the fava bean. From research conducted by the author at the Weed Research Organization, Oxford. This is a large robust parasite up to 2 m tall with showy, fragrant flowers. It is a major constraint on the culture of fava bean (Vicia faba) in Ethiopia and the Nile Valley. Some resistant varieties of fava bean have been developed. It can also be a serious problem on carrot and several other crops. Figure 15. 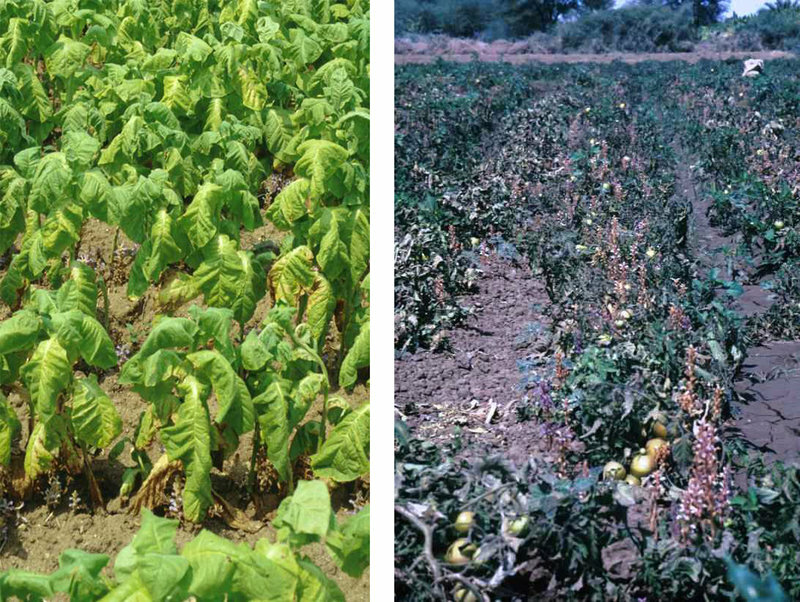 Orobanche ramosa on tobacco in Bulgaria (left) and on tomato in Sudan (right). Note the wilted leaves of both tomatoes and tobacco. In such heavy infestations as the one in the photo on the right, the tomato fruits do not develop; instead, they rot. Also known as Phelipanche ramosa, this broomrape is now found around the world and is considered one of the most serious weeds on a global scale. It has a remarkably broad host range and is a significant problem in tomatoes, potatoes, eggplant, tobacco, several legumes, mustards, and more. In Africa it mainly affects winter vegetables, such as the winter-grown tomatoes in Sudan that are shown in Figure 15. Figure 16. Close-up of Orobanche cumana flowers (left), and O. cumana on sunflower in Bulgaria (right). O. cumana is one of the most serious problems in sunflower culture in eastern Europe; the plant can also attack tobacco, eggplant, and tomato. Though not widespread in Africa, O. cumana reportedly occurs on crops in Northern Africa and Ethiopia and could become a threat to sunflower grown at higher elevations in parts of Africa. A detailed management plan for every parasitic weed species is beyond the scope of this document. However, the control options presented earlier in this Technical Note give rise to several general principles and practices that are summarized in Table 2. No single practice will work in every context or for every parasitic weed species. The most effective strategies are likely to contain a mix of practices that farmers can readily implement. Table 2. Practices that help prevent or reduce incidence of parasitic weeds in farmers’ fields. *This list is not exhaustive; it highlights practices that could be implemented, in some form, by most smallholder farmers. Consult the literature for best practices for specific parasitic weed species in your area. **Be aware of these constraints, but also recognize that there are often ways to address them. The author acknowledges the generous support of the Mary Payne Hogan endowment at Old Dominion University, the U.S. Fulbright Commission, and grant AID DHR 5600-G-00-1021-00 from USAID. The science of parasitic plants was launched in 1969 by the publication of Job Kuijt’s magisterial Biology of Parasitic Plants (Kuijt, 1969). Since then, a series of books on parasitic plants has appeared [e.g. Heide-Jorgensen (2008); Parker and Riches (1993); Press and Graves (1995); Joel et al. (2013)]. Other helpful reviews of parasitic plants include Nickrent and Musselman (2017) and Těšitel (2016). With the establishment in 1978 of the newsletter Haustorium, edited by Parker and Musselman, the current literature on parasitic plants is exhaustively reviewed twice a year. Copies of all issues of the newsletter are available online, along with composite files that allow for easier searches. Ayongwa, G.C. 2011. Understanding the Diverse Roles of Soil Organic Matter in the Cereal – Striga hermonthica Interaction. PhD thesis, Wageningen University, 132 pp. Dawson, J.H., L.J. Musselman, P. Wolswinkel, and I. Dörr. 1994. Biology and Control of Cuscuta. Reviews of Weed Science 6:265-317. Ejeta, G. 2007. The Striga Scourge in Africa: A Growing Pandemic. In Integrating New Technologies for Striga Control, edited by G. Ejeta and J. Gressel. World Scientific Publishing pp. 3-16. Gobenaa, D., M. Shimels, P.J. Rich, C. Ruyter-Spirab, H. Bouwmeester, S. Kanuganti, T. Mengiste, and G. Ejeta. 2017. Mutation in Sorghum LOW GERMINATION STIMULANT 1 Alters Strigolactones and Causes Striga Resistance. PNAS 114(17):4471-4476. Heide-Jørgensen, H. S. 2008. Parasitic Flowering Plants. Brill. Joel, D.M., J. Herschenhorn, H. Eizenberg, R. Aly, G. Ejeta, P.J. Rich, J.K. Ransom, J. Sauerborn, and D. Rubiales. 2007. Biology and Management of Weedy Root Parasites. Horticultural Reviews 33:267-349. Joel, D.M., J. Gressel, and L.J. Musselman, Editors. 2013. Parasitic Orobanchaceae Parasitic Mechanisms and Control Strategies. Springer. Khan, Z.R., A. Hassanali, W. Overholt, T.M. Khamis, A.M. Hooper, J.A. Pickett, L.H. Wadhams, and C.M. Woodcock. 2002. 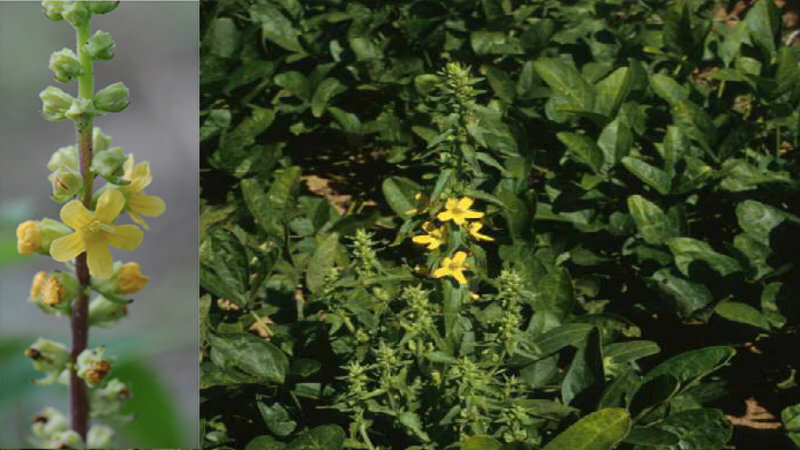 Control of Witchweed Striga hermonthica by Intercropping with Desmodium spp., and the Mechanism Defined as Allelopathic. Journal of Chemical Ecology 28(9):1871-1885. Khan, Z.R., C.A.O. Midega, A. Hassanali, J.A. Pickett, and L.J. Wadhams. 2007. Assessment of Different Legumes for the Control of Striga hermonthica in Maize and Sorghum. Crop Science 47:728-734. Matusova, R., K. Rani, F.W.A. Verstappen, M.C.R. Franssen, M.H. Beale, and H.H. Bouwmeester. 2005. The Strigolactone Germination Stimulants of the Plant-Parasitic Striga and Orobanche spp. are Derived from the Carotenoid Pathway. Plant Physiology 139:920-934. Murage, A.W. , C.A.O. Midega, J.O. Pittchar, J.A. Pickett, and Z.R. Khan. 2015. Determinants of Adoption of Climate-Smart Push-Pull Technology for Enhanced Food Security Through Integrated Pest Management in Eastern Africa. Food Security 7(3):709-724. Mohamed, K.I., L.J. Musselman and C.R. Riches. 2001. The Genus Striga (Scrophulariaceae) in Africa. Annals of the Missouri Botanical Garden 88:60-103. Nelson, S.C. 2008. Cassytha filiformis. Plant Disease (PD-42). Cooperative Extension Service. College of Tropical Agriculture and Human Resources. University of Hawaiʻi at Mānoa. Parker, C. and C. Riches. 1993. Parasitic Weeds of the World: Biology and Control. CAB International. Polhill, R. and D. Wiens. 2000. Mistletoes of Africa. Royal Botanic Gardens, Kew. Rodenburg, J., J.J. Morawetz, and L. Bastiaans. 2014. Rhamphicarpa fistulosa, a Widespread Facultative Hemi-Parasitic Weed, Threatening Rice Production in Africa. Weed Research 55(2):118-131. Samejima, H. and Y. Sugimoto. 2018. Recent Research Progress in Combatting Root Parasitic Weeds. Biotechnology & Biotechnological Equipment 32(2):221-249. Sarić-Krsmanović, M. and S. Vrbničanin. 2015. Field dodder-How to control it? Pesticides and Phytomedicine 30(3):137-145. Těšitel, J. 2016. Functional Biology of Parasitic Plants. Plant Ecology and Evolution 149(1):5-20.